Before you go switching to the first soy milk you can find consider this: Similar products (but different brands) are not created equal. Every brand has their own formulation with wide variations in phosphorus and potassium. Alternative milks are notorious for phosphate additives, so finding a good brand is critical. First and foremost, always read your labels. Yes, always read your labels. And finally, always read your labels . The better you get at reading labels, the more power you have with your renal diet choices. Why is that? Label reading is your best tool to figure our you are really consuming especially phosphorus. Phosphorus (whom I call Pesky Phos) is naturally found in almost all the milk alternatives out there. Almond milk, rice milk, and soymilk naturally have 20 mg, 50 mg, and 80-150 mg of phosphorus per cup, respectively (psst…that’s not too bad compared to the 230 mg found in cow’s milk). Almond milk and rice milk are naturally low in phosphorus, with soymilk being relatively higher. The real problem is that phosphorus is added to alternative milks. This significantly increases the phosphorus content of a product. For example, a cup of Great Value™ Soymilk Original has tri-calcium phosphate and 250 mg of phosphorus, whereas a class of soymilk without these additives only has 80-150 mg. Also important to note, the phosphates added to these milks are inorganic phosphates. That’s especially not good when it comes to phos because they are very bioavailable aka efficiently absorbed by the body..
Second thing you should know is how you’ll know if it actually has phos. 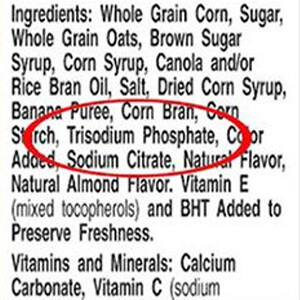 Phosphorus is not always found on the nutrition facts panel, which makes it harder for you to know if it was added. This means you must get to know the “ingredients.” That’s the miniscule list below the nutrition facts on your label. Next up for things to consider is potassium. After some extensive quality time in the natural foods and milk aisle of our local store, (brrr…) we were enlighted by the drastic variations in potassium among products. Soy milk is naturally high in potassium, having about 250-440 mg per cup. This doesn’t mean you can’t drink soy milk but for those with a potassium restriction, this is not your best choice. A lower potassium alternative would be almond milk and rice milk, which only have 150-250 and 20-80 mg per cup, respectively. Let’s move on to talking about specific products. Rice milk, without additives (not “enriched”), is one of the best milk alternatives due to its low potassium and phos content. Rice Dream™ Rice Drink Original Unsweetened, or Vanilla is lowest in potassium and phosphorus. This product does not contain phosphate additives and only has about 65 mg potassium per serving. It is much thinner (“watery” being the derogatory term used here by purists) than the other alternative milk products. Almond milk, without additives, is another good milk alternative. The brands to look for are Silk™ Unsweetened Almond Milk (vanilla or plain) and Silk™ Almond Milk Light—these do not contain phosphate additives and are low in potassium (35 mg per serving). When it comes to soy milk, it you can’t escape the potassium and naturally occurring phosphorus content so going for an different alternative milk is a good choices. HOWEVER, because we believe in making as many foods as possible, “can-do” and if you love soy milk , Pacific™ Soy Select is your best option. It contains 220 mg of potassium and 80 mg (or 8% DV) of phosphorus. Most of the products we’ve mentioned are store bought ready-to-drink. Making your own milk is actually quite simple and inexpensive for something like oat milk (my personal favorite). Making your own milk obviously allows you to eliminate any additives and sweeten it to your own taste. We hope to post our own alternative milk soon, but until then, here is one that we like from OhSheGlows.com: Oat Milk. Also, an important mention here about your local dietitian. All dialysis units generally have a dietitian on staff (or they should) and she can guide you through local products and help you find one right for you. If you are a patient with earlier stage kidney failure, don’t hesitate to ask your doctor about visiting with a registered dietitian specialized in kidney disease. I created a table below to compare some of the best milk alternatives I’ve found. If noted as “0” mg it may mean that the info was not available. Comment below on other alternative milks that you like and have tried! Hi, I just started dialysis around a month ago. I am very new at this. Your website is very interesting and helpful. Thank you so much!!! glad it can be helpful and hopefully more and more new ideas! So glad you are finding new ideas! Thanks for visiting! Rice dream Original Non-Fortified is the best (lowest Phos. & Pot.) for CKD and ESRD patients. It has been a staple on cereal and for cooking for me for years, making it easier for me to meet my highly restrictive dietary goals. Make sure you get the Non-Fortified version; it is a little hard to find. I usually order it on-line by the case (it is very shelf stable). Thanks for sharing your insight here! I agree with the Rice Dream Non-fortified milk sub. It is hard to find but the lowest in phos and potassium. I am always disappointed with the number of milk subs with added phosphates these days. Looking forward to updating this post in the next couple months as there have been lots of new products and product changes since I originally posted 2 years back.